Ask Hope Robertson: What’s the Best Grey Paint Colour? Hope: What’s a good grey paint colour for a bedroom? (One with silver undertones vs green or brown). So happy you asked. It’s appropriate too, since earlier this year I had my house painted, and one of my colours of choice was a soft grey. There are several variations floating around for the best grey paint colour, but speaking from experience, this is mine. It just so happens that one of my favourite rooms is painted in a colour called “Mercury Glass” (Martha Stewart G31, which I had colour-matched to my paint brand of choice, Benjamin Moore). While it’s not a loud colour by any means, Mercury Glass is a versatile neutral, a colour that doesn’t dictate or play a factor in choosing furniture colour, fabric accents, or flooring. This paint colour has cool undertones, and it’s the best grey I’ve come across so far. A fresh coat of paint can work wonders when it comes to freshening up a room or redecorating. If you’re taking on the task as a DIY project, it’s important to remember to prime your walls before painting to maximize the life of your paint. Also, keep in mind that lighter paint colours tend to give the illusion of more space, which can really work to your advantage depending on the size of the room you’re painting. Happy painting! Let me know how your room turns out. Be your own unique self. The reality of it is that there’s only one you. Nobody else can illustrate you better than you. Fact: You’ve got one life to live, so rather than spend your time comparing yourself to others, and rather than trying to be ‘cool’ or like your favourite ‘idol’, just be you. If you’re not, you’ll never be the best you can be, and you’ll always come in second place. You were created as an individual with a unique purpose. I don’t mean to go all Oprah on you, but lately I’ve realized the importance of embracing my unique self and not posing as something other than what I really am. I hope you’re encouraged on this February morning. Happy Monday, my friends! Hope: Do you have a lotion you recommend for the winter? My skin is very dry, but I have a hard time finding the right moisturizer because I have sensitive skin. I also have sensitive skin, and in the winter it becomes even more easily irritated (if that’s possible). It’s taken me a few years to really find the right moisturizer for my skin, but what I’ve been wearing for the last year is Clinique Moisture Surge Extended Thirst Relief ($57.50 for 2.5 oz., Clinique). Seriously, this stuff saves my skin the whole year through! I’ve had no problems so far this winter season with dryness. The best part about Clinique’s Moisture Surge is that your skin soaks it up but doesn’t become oily. Everybody’s skin is different, but this moisturizer is unscented and made for sensitive skin. Try it and I hope it works for you! Finish with a spot treatment of Oxy on any small blemishes. Cover blemishes with Clinique Airbrush Perfect Concealer ($25.50, Sears) in fair. Wanted to share a little news with you all. Starting today at 8am EST, you can hear me on Blackburn Radio’s am920 for a special set we like to call “Hope Says Style”. I hope you’ll visit am920 to listen Wednesday mornings and check it out! Ask Hope Robertson: What’s a Memorable Hostess Gift? Hi Hope: I love your site. I’m going to a party, and plan to take a hostess gift. I want to take something other than a bottle of wine. Can you help me find a gift that’s unique and affordable? More than happy to oblige! A hostess gift is an important thing, because it’s something your friend — or co-worker, or future mother-in-law — will remember for years to come. A bottle of wine is too predictable; it’s also too easy and doesn’t require a lot of consideration or thought. My recommendation for something that doesn’t break the bank but that’s guaranteed to last longer than a bottle of booze? A personalized stamp or letter embosser. Both are items that your hostess will keep, and both are practical items that your hostess will use. Things to keep in mind? A letter embosser has more longevity than a stamp, and they cost around the same price. Whilst my preference would be for a letter embosser (or even a library embosser), a personalized stamper is also a noteworthy gift. Hope this helps! Thanks always for reading. Ask Hope Robertson: Can A Man Wear Cable Knit? Hey Hope: My girlfriend bought me a heavy-style cable knit sweater that she wants me to wear this Fall. Can a guy really wear cable knit or what will that look like? How does a man in a cable knit sweater look? In a word, hot. A guy who can pull off — or in your case, put on — a heavy sweater in a cable knit will garner some serious style points from his significant other (or any woman, for that matter). A cable knit sweater is appropriate wear for Fall and Winter, and it doubles as both dapper and practical. Think of it like this: I’d be willing to wager that a chunky cable knit sweater is so comfortable you’d trade your classic hoodie for it. A cable knit sweater wears well over a basic tee or button down and your favourite jeans. You can dress it down with your Converse All Stars, or dress it up with a pair of cordovan boots. So kudos to your gf for her good style sense, and also to you for your willingness to let your better half style your wardrobe! Hope: I have a black taffeta mini skirt but I’m unsure what type of top I should wear with it. What are your suggestions? I love a good mini skirt, and a black taffeta mini skirt? Hellooo. I’m sure it’s divine. My suggestion for you is to keep your style simple. Assuming you’re going to dress up your look since your skirt’s made of taffeta, go for a shirt that is simple yet chic so your outfit will look effortlessly elegant. J.Crew has a collection of shirts that can work for a variety of occasions; and one of their silk t-shirts will provide a comfortable and chic look. Like your favourite v-neck shirt but done in a washed silk habotai (translation: “China Silk”), this t-shirt is one of the softest you’ll ever style. Sure it’s a t-shirt, but it’s anything but basic. This J.Crew silk two-way tee features knit panels on the sides and arms, as well as braided fabric on the neckline. I think the warm taupe colour would add warmth to your taffeta skirt. Pair your skirt with black tights, black heels, and accessorize with some sparkle on your neck and arm. Makeup with red lipstick for pop, and POW! You’ve got a timeless look that’s sure to stand out. Silk two-way tee, $79.50, J.Crew. The boatneck of this striking blouse is universally flattering. Designed in a washed silk crepe de chine, this J.Crew silk blouse has lots of drape and wears almost as loose as a tunic. It has slits at the sleeves, hems, and a raw-edged trim. The zip at back adds a little edge to an otherwise sophisticated shirt. Again, pair your taffeta mini skirt with black tights and black heels, and wear several chain necklaces to complement the metal back zip. You could either do dramatic makeup or something a little more understated. Another classic look that you’ll come back to for years to come! Francille fray blouse, $98, J.Crew. Hope – I hear the military trend is going to be big this fall. Can you suggest some items I can buy to go along with it? Dear readers, I love it when you ask questions and don’t specify a budget. Seriously. I could go all Balmain on you and suggest a $12000 jacket, but I’ll try to keep things — almost — realistic. Military has been an acceptable style for almost four seasons now. This year during the Fall 2010 RTW shows, we saw subtle nods to the trend in collections from Dries Van Noten, Celine, and Burberry. To translate the military trend into your personal Fall 2010 wardrobe, you don’t really need a lot. You can infuse some style-savvy into your look with something as simple as a gold-tone button detailing and military green khaki pants. Read on! Luxe: Check these Christian Louboutin ‘Loubout’ wool peep-toe ankle boots. Available in khaki green or navy blue, these booties are total military. Covered in wool, these Louboutin booties pull on, have a 6-inch heel, and flirty peep-toe styling. And, in true Louboutin style, these booties wouldn’t be complete without that signature red leather sole. They’re a most-expensive military tribute priced at just more than $1000 CDN. If you can afford them, more power to you. Available at Saks. Splurge: Not everyone’s budget affords them Christian Louboutin shoes, but that doesn’t mean the every girl can’t indulge in a little designer. I’m loving the Alexander McQueen diffusion line McQ. More youthful than his namesake designs, the McQ line features lots of denim and military-inspired coats like this short denim jacket. Like the Louboutin booties, this McQ jacket features frogging details (frogging = military uniform looped button fasteners), dark green stitching, and a high round neck. It’s the perfect coverup to carry you into cooler weather. Originally $580, now $203. Available at TheOutNet. Budget: You can’t go wrong with a little J.Crew. Always spot-on style, this fashion-forward retailer does the military trend terrifically in a classic everyday chino. The lean leg and relaxed fit look especially chic when you fold-over and scrunch the cuffs. Composed of comfortable cotton, these khaki pants will become mainstays in your closet. Trust me. This said by the girl who owns at least three pairs. J.Crew’s everyday chino sits right on the waist, and features side pockets and back welt pockets. They’re figure-flattering, and you can wear both at work and play. Find them in five colours (shown here in fatigue green) for $59.50. Available at J.Crew. 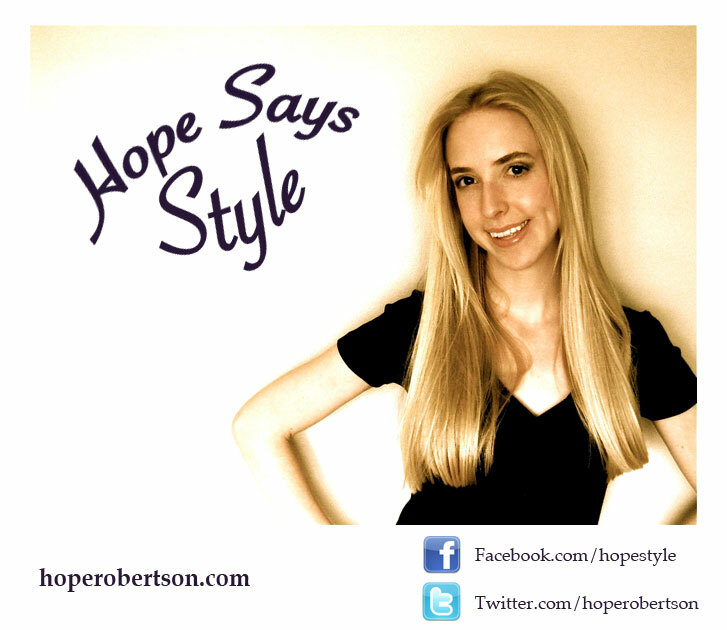 Ask Hope Robertson: What Should Be in My Wardrobe? Hope! My fiancé recently told me she feels like I’m a child because she needs to dress me. Almost everyday before I leave for work, she forces me to change clothes. Do you recommend anything I could have in my closet so I can pass her dress code check? Oh dear me. Well, at least your girl’s got style, right? If I could only recommend three essentials for your closet, I’d send you straight to J.Crew (or Banana Republic). I’m a firm believer that every man should own at least one – emphasis on the at least one – cashmere sweater. V-neck works best because you can style it for work and weekend. For work, wear a buttondown shirt underneath in a coordinating or contrasting colour, and pair with dress pants. For weekending, wear your favourite t-shirt underneath and sport the sweater with jeans and sneakers. Second, I’d tell you to buy a few banker stripe shirts (if you don’t already own one). J.Crew’s secret wash button-down banker stripe shirt has a tailored fit and soft feel, so it’s not only practical, it’s comfortable too. Buy in blue and pink (if that’s budget-friendly. Trust me, your GF will thank you for it). Last (but not least), every man should own a good pair of slim-lined khakis. Before you speak up — shut up. Slim-lined doesn’t mean tapered or skinny. In fact, it means just the opposite. Slim-lined khakis in a crisp cotton twill (like J.Crew’s regular fit chinos) are completely classic and totally refined. You can wear them in an office casual environment, and you can wear them when you’re off-duty. Win-win, my friend. If your budget affords it, buy them in khaki and grey. As far as your shoes go, you need a classic pair of slip-on loafers in both black and brown. Italian leather will last forever. Casual shoes can mean Jack Purcell® sneakers, Sperry Top-Sider® boat shoes, or MacAlister boots. Enough? I hope so. Don’t dread getting dressed — it should be one of the most fun parts of your day! AND, be thankful you have a fiancé who cares about your appearance. Ask Hope Robertson: What Type of Wedding Dress Will Suit My Figure? Hi Hope! I’m getting married next October in Tennessee and am shopping for my wedding gown. I’ve put away about $400 for it. We don’t really have a theme, but the flowers will be a mix of daisies, violets, and pink baby roses. I know I want something classic and nothing over the top. I have a pretty athletic build, about 5’4″, blonde hair, blue eyes. Congrats on your impending nuptials. Choosing your wedding gown is a pretty big deal (duh). You definitely want a dress that’s both memorable and unique, so my suggestion is to forego anything strapless. Without exaggeration, every one of my girlfriends who’s been married in the last four years has worn a strapless gown. While each one was beautiful, after a while every strapless dress starts to look the same. And since you’ve got an athletic build, some kind of strap or upper accoutrement will help to accentuate your figure. There are so many bridal gowns out there, but here a few from David’s Bridal that I really hope you love. I’m loving this satin and organza number (L). Both frilly and feminine, it features subtle spaghetti straps and a pleated v-neckline. A satin band sits at the natural waist, and several tier layers flow out into a A-line skirt. The back is ballerina-style, and dips midway. Gorgeous, right? It’s available in both white and ivory, depending on your skin tone. Another dress that caught my eye is this Galina one-shoulder gown (C). Contemporary but still classy, I love the flower details on the shoulder. They turn into triple spaghetti straps in back and add a bold touch to a gown that’s elegant and ethereal. Love, love, love! The one-shouldered style will definitely show off your shoulders. Again, this gown is available in both white and ivory. If you’re looking for something with lace details, check this trumpet-style gown with lace cap-sleeves (R). The lace segues into a keyhole back, and is complemented by a beaded sash. Definitely conjures up images of classic Hollywood beauties like Greta Garbo or Grace Kelly, non? While it would put you a little over budget, if you can save a little more this gown would be worth it. It’s also available in white and ivory. In addition to your dress, I hope you keep accessories in mind. Whether you want to throw in a dash of colour – perhaps in keeping with the old adage “something blue” – in the form of a pashmina, dramatic jewelry/hair accessories, or shoes, remember to really personalize your look. This is your day, so celebrate you!